2016 is drawing to a close and has been a very busy year for us at Wordfence. In today’s post I’d like to share some of the major events for Wordfence in 2016 and some interesting data. In 2016 our support team resolved 15,976 Premium support tickets, site cleanings and general inquiries. Our average response time for Premium support requests was 3 hours and 25 minutes to get a first response to the customer. The average for the past 3 months was 2 hours 26 minutes and then the past month has been 1 hour and 59 minutes. It’s great to see our good response time get even better as the team works to improve our processes. That’s a total of 6,754 support responses so far for our free customers in addition to the premium support that our team provides in our ticketing system. We’re proud of our contribution to open source software with Wordfence and the contribution we make to the community. It’s an important part of our mission to secure WordPress. The Wordfence engineering team has been very busy this year. 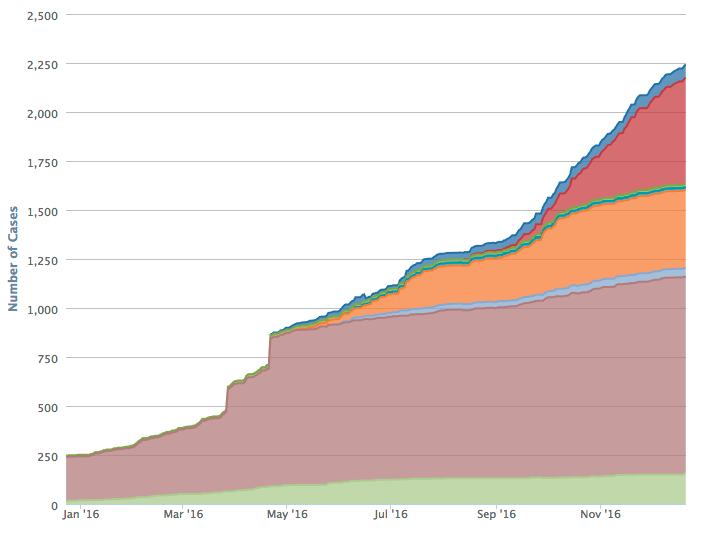 The chart below shows the projects we have been working on and the number of bugs and features we resolved for each project throughout 2016. The large brown section is the core Wordfence plugin. As you can see we did a huge sprint for the Wordfence 6.1.1 release in April. Our engineering team was almost exclusively dedicated to 6.1.1 because it was such a large and ambitious project. I’m incredibly proud of how the team took big risks to improve our customer website security and delivered in a big way! Once we completed 6.1.1, we kicked off several new projects that are running concurrently. Work on the core Wordfence plugin has continued and the engineering team has expanded their focus into other projects. Some of those initiatives are confidential which is why this chart does not include a legend. We will have a few big announcements to make in early to mid 2017. To date Wordfence has been downloaded over 22 Million times. We saw our product downloaded between 180,000 and 400,000 times each week in 2016. In 2016 we launched 28 new Wordfence releases, each with significant improvements to help keep our customers secure and make their lives easier. The most significant release in the history of Wordfence was on 12th April, when we released wordfence 6.1.1 which included our new Web Application Firewall. This was a game changer for our company and our customers. Wordfence had finally matured into a full featured firewall and malware scanner complete with real-time updates. Since the 6.1.1 release we have been continuously releasing scan and firewall updates in real-time to our customers via the Wordfence Threat Defense Feed. On September 8th we released Wordfence 6.1.16 which integrated our malware scanner with the Wordfence firewall. This release introduced real-time scanning for requests that may contain malware. On September 27th we released Wordfence 6.2.0 which was another big step forward. We had been quietly working with hosting providers to understand how we can improve compatibility across their systems and reduce operational load. Wordfence 6.2.0 increased the scan performance of Wordfence by 18 times on average. The more files a user has, the bigger the performance increase. On October 11th we released Wordfence 6.2.1 which again improved the firewall by adding the ability to intelligently parse anything that looks like PHP code and determine if it is malicious or not. This further improved our ability to detect incoming malware via the firewall and block it. Wordfence 6.2.4 was released on November 9th which further improved scan performance for sites that are very large with many files. In addition to constantly improving Wordfence, we have been steadily growing the number of malware signatures in the Wordfence Threat Defense Feed. Today we have 1169 unique malware signatures in production and many of those detect multiple malware variants. Our free users have 1003 signatures available and our Premium customers have 166 recently added signatures available that were released to their sites in real-time during the past 30 days. We also have 570 scan signatures in beta which our team is testing and will be releasing during the coming weeks to continue to improve our malware detection capability. The wordfence team is now 23 people in locations that include Washington, Nebraska, Florida, Virginia, Pennsylvania, Colorado, Maine, Ohio, Tennessee in the USA and in Sweden and Greece internationally. Our whole team at Wordfence works remotely. We use Slack for about 80% of our communication and VOIP chat and conference tools for the rest. We started using Slack in early 2015. The chart below shows how our communication has increased over the past 1.5 years as the team has grown and the number and intensity of our projects has increased. It’s interesting to note the spike in April 2016. That was when we released Wordfence 6.1.1 which included the Wordfence Firewall. It was a time of intense product testing and communication among the team. We are currently involved in another all-consuming project which we will announce in 2017 and as you can see, communication is beginning to spike again in December. I expect January 2017 to be quite spectacular as the team ramps up. 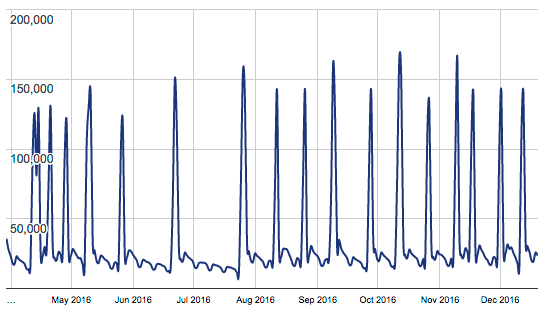 The Wordfence Blog has also been very busy in 2016. In the past year, this blog has been visited by over 900,000 unique people. This year we received 2,190 comments from 1,414 people. I’d like to thank you all very much for visiting us and participating in the conversation here throughout the year. The Wordfence team and I read all of your comments, we appreciate the positive feedback and we pay attention when you share an opinion or you share data with us. Thank you for your support and encouragement in 2016! Thanks to Dan Moen for help editing this post. 21 Comments on "2016 for Wordfence: A Break-Through Year"
Mark, WF Team, you guys are seriously awesome. I couldn't have asked for anyone better to help me maintain and secure my websites. Here's to you, and to an awesome 2017. Thank you. I'm a new subscriber but am really pleased to be on board. I would just like to wish all at WordFence a very happy Christmas and a rewarding new year, your company has worked tirelessly to bring WordPress security into the 21st century, and to reduce the opportunities for scammers and spammers to hijack websites to do their no good deeds. I am sure I speak for most WordFence users when I say that WordPress and and web in general is much more secure as the result of your efforts, please keep up the great work and keep moving forward in 2017. Thank You WordFence! Thank you Mark and your team. You have not only provided us with a great security product but also given us a vast amount of knowledge and information. Hope you guys have an awesome 2017. Thanks to all of you for the outstanding way that you have protected our websites, informed us of security happenings, and provided great customer support. May all of you have a great Christmas and New Year. You can only get better going forward! Thank you Mark and all your team, you've restored my sanity and allowed me to sleep! Your blog articles are always informative and demonstrate good salesmanship. Something that we hope to emulate. Thank you for creating and supporting great security product. You are a marvelous team. Thanks a very lot for your efficient and creative work :-) I wish you a very Merry Christmas and a succesfully New Year! Merry Christmas and a Happy and successful New Year 2017 to you Mark and team. You guys make the WordPress community a great platform. My sincere thanks to all your efforts and achievements. What a run. Your team is spectacular – thank you! Thank you for your excellent work. I love Wordfence and your constant security vigilance is wonderful. Well done, and thanks for all your hard work. Thank you guys for everything you do!! I'm a big fan. I will keep recommending your services. Have a great New Year! Wordfence is what helps me sleep at night. Thank you all at Wordfence for the wonderful work that you do to help keep our websites safe. You have always responded in quick time to any queries or problems that I have had over the past couple of years. Thank you soooooooo much. I wish you all a very happy Christmas and brilliant 2017. Thank you all at Wordfence for the awesome support you gave us and to help us in keeping our websites safe in our today's world. Keep up the good work. Heard about you on the Security Now! podcast recently (I do the transcripts) and signed up immediately. Thanks, and best of luck in 2017. Thanks Elaine, I didn't realize we got a mention. Thanks for that, and please thank the author(s) for me. I'll have to find that and give it a listen. Thanks! Found it earlier and I shared it with the team.